“In the reign of good Queen Vic, there stood, in Dumpling Lane in old London towne, the Moustache Shoppe of one Ebenezer Blackadder -the kindest and loveliest man in all England” … so begins “Blackadders Christmas Carol” a one off special episode of the cult classic british comedy series Blackadder starring Ebenezer Blackadder (Rowan Atkinson), Mr. Baldrick (Tony Robinson) and narrated by Hugh Laurie (now famous from his role in the tv series “House”). 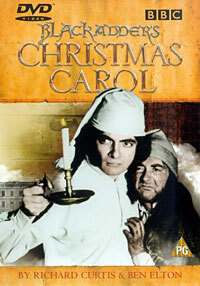 Blackadders Christmas Carol is a parody of Charles Dickens’ famous book “A Christmas Carol”. Set in the year 1850 in “old London towne” the show was produced by the BBC, 1st broadcast on BBC One on 23 December 1988 and regularly re-broadcast on BBC TV around Christmas time but rarely seen on Australian TV. Being the the kindest and loveliest man in all England makes Ebenezer Blackadder the “black sheep” of the Blackadder dynasty as all his relatives in the past and future are complete and utter scoundrels. The Spirit of Christmas congratulates him for his kindness and generous spirit and lets him see shades of the past: his ancestors Lord Blackadder and Edmund Blackadder, the butler of the Prince Regent (Hugh Laurie). Instead of being convinced that he is better than them, he grows to admire their ruthlessness and asks the spirit to show him what could happen if he became like them. Blackadder sees a vision of a distant future where his distant descendant Admiral Blackadder is a successful official of a Universe spanning Empire about to marry the Queen. Blackadder asks the Spirit what will happen if he stays kind. As an answer, he sees an alternate vision of the same future era where his descendant is a semi-naked slave of the incompetent Admiral Baldrick. Shown this stark contrast Ebenezer Blackadder takes revenge on all those who took advantage of him when he was good and becomes the cynical scoundrel we all know and love – causing him to miss a golden opportunity to become rich and powerful. Blackadder -- the kindest and loveliest man in all England. Ebenezer:  [from outside the main door]  Humbug! Humbug! [holds out the bag, in offering]  Humbug, Mr Baldrick? Baldrick:  ....and I've nearly finished the Christmas cards. "A Merry Messy Christmas." `Christmas' as an H in it, Mr Baldrick. spell `Christmas' without getting any of the letters right at all. helping out with the workhouse nativity play. Ebenezer:  Oh, of course! How did it go? it comes to staging quality children's theatre. What did you do? Ebenezer:  Oh, thank goodness. ....and his name? mankind if all Jesus had ever said was "Woof." Ebenezer:  ....on some other dogs. Baldrick:  Yeah.... and the moment Jesus got a whiff of them, he's away! While the angel's singing "Peace on Earth, Goodwill to Mankind,"
Ebenezer:  Scarcely appropriate behaviour for the son of God, Mr Baldrick. they want to see us nail up the dog. somewhere in the middle, everyone is enjoying Christmas. What are you doing, Albert? up this cushion for your surprise Christmas present? Victoria:  Oh, dear Alby, don't worry -- I don't mind. Victoria:  Our traditional Christmas adventure! Albert:  Oh, yes! Of course! The traditional Christmas adventure! Albert:  Oh, yes! Of course! Dummkopf! [stands]  How could I forget? and presents. What more could a man desire at Christmas? Baldrick:  It's a bit of a tiddler, ain't it? year's profits to spend on fun and larks! Baldrick:  How much is it? Ebenezer:  Seventeen pounds and a penny. Ebenezer:  Well, bless my ten toes! Who could that be on this cold night? Ebenezer:  Ah, Mrs Scratchit! Greetings to you on this merry Yuletide Eve. No goose for Tiny Tom this year!!! Ah! That box of matches in your basket is just the thing I need. Scratchit:  [holding up the box, suddenly not crying]  A quid a match. so here: take ten pounds. of a criminal genius! Here: seventeen pounds, then. Ebenezer:  [calls after her] ....and my best wishes to your massive offspring! seventeen pounds and a penny minus seventeen pounds leaves....? Thirty-eight pounds, eight shillings, fourpence! Boy:  Merry Christmas Eve, Mr Slackbladder -- I mean Blackadder! Ebenezer:  [approaching]  Ah! and to you, young urchin! Boy:  A penny for Christmas cheer, sucker -- I mean sir? pie for yourself and your silver-haired mother? Boy:  Nah, sod that -- I'm off to the gin shop. Ebenezer:  [looking out the back window]  Oh! and my God-daughter, Millicent! Mr Baldrick [he puts the ear muffs on], and let her in. Ebenezer:  Ah, Millicent! To what do I owe this excellent pleasure? Millicent:  Oh, I just thought I pop round, you know, just on the off chance. as she mentions them] a scarf and a pair of gloves to match! Ebenezer:  [making sure his earmuffs remain in place]  Yes, jolly good. Ebenezer:  Oh, what a splendid idea! Baldrick:  [sarcastic]  Why don't you take the flipping tree? Ebenezer:  Bye! [removing the earmuffs]  My, what a jolly young girl. Baldrick:  Yeah -- pity she nicked all the presents. Ebenezer:  Well, peel my tangerines! This >is< [?]! lovelied in every possible way! season to you, sir. Peace on Earth, and fat tums to all men. Ebenezer:  Well, indeed, indeed.... and what of your little orphan charges? Beadle:  Well, I don't think I charges them enough, as a matter of fact. Luckily, you're here to cover up the shortfall, Mr Blackadder. Ebenezer:  Oh, well, what luck! As fate would have it, we have some. from you! Absolutely not! [picks up the bowl]  Is this all, is it? Ebenezer:  Well, what a jolly fellow! Baldrick:  Looked like a fat git to me. Baldrick:  ....>thin< git. Here; those orphans were a bit fat, too. showered in two dozen semi-digested pies.... But what of it? in the sky, someone will come and reward us.... come on! Ebenezer:  Well, baste my steaming puddings! Ebenezer:  Ah, good evening, sir and madam. Victoria:  Give us ten pounds for the virtuous old lady next door. Albert:  Surely you must have something.... What about a goose? Victoria:  Oh, that sounds ideal! Ebenezer:  Well, there's a bit of luck! Mr Baldrick, fetch the turkey! Albert:  Ah, nein! [slowly, trying to enunciate]  I am from....Glasgow. Ebenezer:  Ah, a fine city! I love the Gorbals! I'll give them your regards. him at the end of it. Baldrick:  Well, if I don't hang my sock out, how will Santa fill it? else to stay up for. Good night, Mr Baldrick. It come through the wall, it said its piece, and then it sodded off. begins to thrust his arms about, then does more, quicker, "Woo!" a wee bit of haunting, getting misers to change their evil ways. Ebenezer:  Well, can I get you a cup of tea or anything? Spirit:  You wouldn't have anything a wee bit more, er, medicinal....? Spirit:  [picks up bottle]  Oh, nothing but the best at this house, eh? his heating bills by using his John Thomas as a draught excluder! line drawings, but the visions are more effective. Ebenezer:  Well, what sort of thing? to be the full one-hour-ten vision with a break and ice cream. Ebenezer:  Oh, dear! That bad, were they? Baldrick:  Come on, My Lord! Give it a little pull! You know you want to! It'll be ever so exciting! novelty death warrant, and you give it to a friend. Baldrick:  Have you got anything for me? Edmund:  Oh, it's nothing, really. Edmund:  No, it's really nothing. I haven't got anything for you. Edmund:  Good morning, Your Majesty. Christmas again, eh? What joy. [puts the portrait down]  Don't you just love it? Elizabeth:  No -- I hate it! In fact, I've just abolished it. Elizabeth:  [points at portrait, speaks demandingly]  What's that, Edmund? motions to Lord Melchett, who approaches]  Ah, Melchett! Greetings! Melchett:  ....and compliments of the season to >you<, Blackadder. has banned the Christmas, so I wouldn't get her a present this year. Edmund:  [claps his hands once]  Hah! Got him with my subtle plan! Baldrick:  [lowering the portrait finally]  I can't see any subtle plan. across his neck and makes a quacky noise]. Baldrick:  What, he'll turn into a duck? without having her head cut off. Elizbeth:  We knew; if he gave her a hat, she'd probably be all right. But, Melchett, what have you got under your coat? Elizabeth:  [demandingly]  It's not a present, is it? to Edmund]  You're so painfully transparent, Blackadder. Elizabeth:  Oh, that's fab!!! I >love< presents! marry you! ....if you weren't as unattractive as a giant slug! Melchett:  [laughing]  Oh, pish, Majesty! presents! Um, fancy a castle? Melchett:  Well, a devilish saucy wife would be fun. Elizabeth:  [thinks]  Lady Jane Pottle! Melchett:  No -- Aylesbury's quite far enough. your block off and put it on top of the crimble tree? Thank-- [looks astonished]  Oh! Dear me! Elizabeth:  Is there a name on it? Melchett:  [trying to grab the paper from Edmund]  Ma'am! Ma'am! Ma'am! It's a trick! You've been tricked! Edmund:  You're very kind, Ma'am. Ebenezer:  [with a slight grin]  Good lord! Spirit:  Horrible, eh? [stands, goes to the bedside]  What a pig! shocked]  But, no, as you say, his behaviour....disgraceful. Ebenezer:  `Them'? Are there more? knock on the door. I'll take it from there. Have you got it? Edmund:  Yes, well, you certainly will get it if you mess this up. Edmund:  I cannot conceive, Sir. fellow first, then, is it? Edmund:  It is indeed, Sir. Edmund:  OK, off you go, Baldrick. Baldrick:  Well done, Mr B! I didn't think you'd get it >that< quickly. Prince:  Well, I must say, Bladder, that was damn clever! times to the Thicky Twins. The round hasn't in fact started yet. Prince:  Two silly bulls? I don't think so, Blackadder -- not in The Bible. two pigs, two ants, and two silly bulls? Is that it? Edmund:  Two syllables. what edmund: look we re confused; start again, shall we? silly to be honest. How about a nice Christmas story instead? So, shall I begin the Christmas story? of rum coves on top of a hill in Johnny Arab land. Nelson:  [wakes]  Ah! Oh my god!!! I've gone blind! blind!!! Prince:  Yeah, I can imagine him -- excellent fellow. dying of cold on a cruel Christmas night. Prince:  Not a comedy, then....? presents<, and she lived happily ever after. Edmund:  [obviously]  I wonder who that could be? Prince:  No, Blackadder, you swine! Bring her in! Edmund:  [mutters to Granny]  [?????? ], Baldrick. silver on the way out? Prince:  Oh, no -- tell her to take it! Edmund:  Excellent, excellent, Baldrick! A triumph! [pause]  Baldrick? Baldrick:  Sorry, Mr B -- I was just showing a sweet old granny to the door. Are we ready yet, Sir? collecting for charity, so I let her in. Baldrick:  Something wrong, Mr B? the mental agility of a rabbit dropping. Baldrick:  [having just got back on his feet]  Yeah -- she's not safe, Sir. Ebenezer:  Hah hah! Very amusing! say....disgraceful. But, he actually >got< the presents! Husbands tutti:  Hail Queen Asphyxia, Supreme Mistress of the Universe. forehead and lowers it with two and a half vertical waves]. Blackadder:  Yes, well, that won't be necessary, thank you. Asphyxia:  Approach your slave: Baldrick! ridiculous jockstrap, at least keep your legs together. his forehead and lets it drop straight back down]. Frondo:  What news of the foul Malmydons? Blackadder:  Scattered to the Nine Vectors, My Lord. suckcreamed as a Qvarnbeast's nobbo? Blackadder:  Well, they're dead, if that's what you mean. Pigmot:  Plus, Commander, did you vanquish the Nibblepibblies? because you just made them up. with which you honour me. Bernard:  Oh, lovely -- an ashtray! Pigmot:  [kneels beside Asphyxia]  Come, Majesty -- he wastes our time. I yearn to attend "Twenty Thousand Years of The Two Ronnoids"
Frondo:  Yes! Send him to the sprouting chamber! Asphyxia:  No, wait! [to Blackadder]  What is it, Commander? [He has walked forward; he removes a glove from one hand. Asphyxia:  I thought you'd never ask. hauntings and a scare-the-bugger-to-death to do before morning. Baldrick:  [raising his left arm]  Hail! Baldrick:  I can't remember, Your Majesty. I got a bit confused and dropped a bomb on our own lot. Asphyxia:  Silence, squidling! Bring forth the gift with which you honour me. Baldrick:  Oh, damn, I forgot the bloody present and all. bad guys have all the fun? Ebenezer:  Oh, well, that makes all the difference! Spirit:  So you're going to be a good boy, then? Ebenezer:  Would I lie to you? Looks like Father Christmas just forgot about me this year. Baldrick:  Well, that's the kind of prezzy that shows the most love! What have you made for me, Mr B? Ebenezer:  I've made you.... [takes his hand out] ....a fist. Boy:  Oi! Gitface! How about a penny for the season? Baldrick:  Shall I get that, sir? Ebenezer:  No, Baldrick -- leave them out in the snow until I get dressed. I'll only be about forty minutes. Beadle:  [holding a tiny Christmas pudding]  Compliments of the season, sir. "O! Piggy wiggy wiggy woo! Ebenezer:  [applauds slowly]  Utter crap. Beadle:  Thank you very much, sir. Orphan3:  Do we get a Christmas treat now? Ebenezer:  Yes, indeed you do. Orphan [1 or 2? ]:  What is it? with nothing but a small pudding! Ebenezer:  Ah, how right you are, Baldrick. Door. Baldrick:  You know what I'm hoping? Ebenezer:  What are you hoping, Baldrick? moment, you're going to go "Yo ho ho!" and give me a mince pie. ....and she seems to have brought the fish course with her. Ebenezer:  Who, my dear, is the huge halibut in the trousers? Millicent:  This is Ralph -- he's my fiance. Baldrick:  I was thinking the same thing myself. Ebenezer:  [hits Baldrick in the back of the head] ....when spoken to. emptier than a hermit's address book. God-daughter in the manner to which she is accustomed? I'm going to have a party, and no-one's invited but me. [Baldrick heads for the door; Ebenezer heads for the back room. Scratchit:  But he's a cripple! Ebenezer:  He's >not< a cripple, Mrs Scratchit. Occasionally saying "Phew! from her basket]  Thank you. Scratchit:  But what about my Tiny Tom? Ebenezer:  If I was you, I'd scoop him out and use him as a houseboat. Ebenezer:  It's gone off, Baldrick -- it stinks. philanthropist and all-round softy, Ebenezer Blackadder? Baldrick:  [confused]  What, Mr Blackadder lives here? Alfred:  Ah, that is good, because we have a wunderbar secret! Baldrick:  What would no longer be a secret? Victoria:  [leaning forward, half bowing]  We are Queen Victoria. Baldrick:  What, all three of you? Ebenezer:  I'm not at home to guests. [Ebenezer returns to the back room, where the scene now takes place. one receives a Christmas visit from two such distinguished guests. Albert:  Ah, so you recognise us at last. this year's Stupidest Accent Award is really quite overwhelming. Buckingham Palace must be copiously supplied with blindfolds. Victoria:  Sir! We have never been so insulted in our entire lives! Ebenezer:  What do you wish? Baldrick:  I wish there was some meat on this. like having a go at the real Queen and Prince Albert. Baldrick:  It was< the real Queen and Prince Albert. visits people, she leaves them her Royal Seal. Blackadders				Ooh ooh ooh ooh! ROWAN ATKINSON				Woo ooh ooh ooh! Di dum di dum di da! Lords Melchett / Frondo			Blackadder! Blackadder! STEPHEN FRY				Ti rum ti tum ti ta! Princes Regent / Pigmot			Blackadder! Blackadder! HUGH LAURIE				Ti rum ti tum ti ta!